Key Difference: Apache 2 refers to Apache http server Version 2.x developed by the Apache Software Foundation. It is an open source and free of cost server. Httpd stands for Hypertext Transfer Protocol Daemon. In reference to Apache, httpd refers to the Apache HyperText Transfer Protocol (HTTP) server program which handles the requests. Apache generally runs as a service for Windows NT, 200 and XP. On the other hand, in Unix it runs as a typical daemon that handles requests without any interval in the background. In terms of configuration files, httpd.conf and Apache2.confg are little different. Generally, httpd.conf is the main configuration file for the Apache web server. One can easily find it on Red Hat Enterprise Linux, CentOS, etc. On the other hand, Ubuntu uses apache2.conf as the main configuration file. Apache refers to Apache http server. It is a web server emerged from the collaborative software development effort. It has been developed by the Apache Software Foundation. It is an open source and free of cost. It is capable of supporting multiple platforms, including Linux, Windows, and Macintosh operating systems. It provides a range of features and many of them are implemented by using compiled modules. It provides password and digital certificate authentication. It provides numerous features like CGI, SSL and virtual domains. Apache 2.x refers to the versions of this web server which have been introduced after the Apache 1 series. It consists of Version 2.0, Version 2.2 and Version 2.4. These versions have many enhancements with respect to the earlier versions. Generally, Apache and httpd are used interchangeably. The only subtle difference that seems to exist between them is that Apache generally runs as a service for Windows NT, 200 and XP. On the other hand, in Unix it runs as a typical daemon (httpd) that handles requests without any interval in the background. Httpd stands for Hypertext Transfer Protocol Daemon. Daemon refers to a program that runs always and sends requested data to user. Each server of pages on the Web has an HTTPD or Hypertext Transfer Protocol daemon that waits for the requests from web clients and their users. Using httpd as a service on Windows NT, 200 and XP. Using httpd as a console application on Windows 9x and ME. Apache 2 for windows is multithreaded. Unlike Unix, it does not create a separate process for each request. However, generally two apache processes run (a child and a parent) to handle the request. In terms of configuration files, httpd.conf and Apache2.confg are little different. Generally, httpd.conf is the main configuration file for the Apache web server. One can easily find it on Red Hat Enterprise Linux, CentOS, etc. On the other hand, Ubuntu uses apache2.conf as the main configuration file. It contains the entire default configuration for Apache and thus contains settings that are global to Apache2. 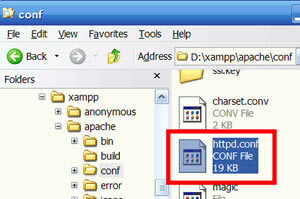 In earlier versions of Ubuntu, a file called as httpd.conf used to be contained inside the Apache 2 configuration file. Now, it does not exist. Apache 2 refers to Apache http server version 2.x developed by the Apache Software Foundation. It is an open source and free of cost web server. Httpd stands for Hypertext Transfer Protocol Daemon. Daemon refers to a program that runs always and sends requested data to user. Main configuration files in Ubuntu.